In 1976, at age twenty-five, Stephen Kinzer arrived in Nicaragua as a freelance journalist - and became a witness to history. He returned many times during the years that followed, becoming Latin America correspondent for The Boston Globe in 1981 and joining the foreign staff of "The New York Times" in 1983. That year he opened the Times' Managua bureau, making that newspaper the first daily in America to maintain a full-time office in Nicaragua.Widely considered the best-connected journalist in Central America, Kinzer personally met and interviewed people at every level of the Somoza, Sandinistas and contra hierarchies, as well as dissidents, heads of state, and countless ordinary citizens throughout the region. 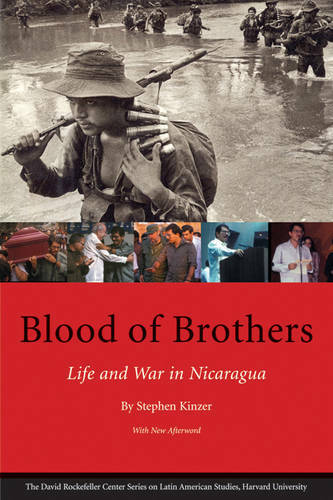 "Blood of Brothers" is Kinzer's dramatic story of the centuries-old power struggle that burst into the headlines in 1979 with the overthrow of the Somoza dictatorship. It is a vibrant portrait of the Nicaraguan people and their volcanic land, a cultural history rich in poetry and bloodshed, baseball and insurrection.